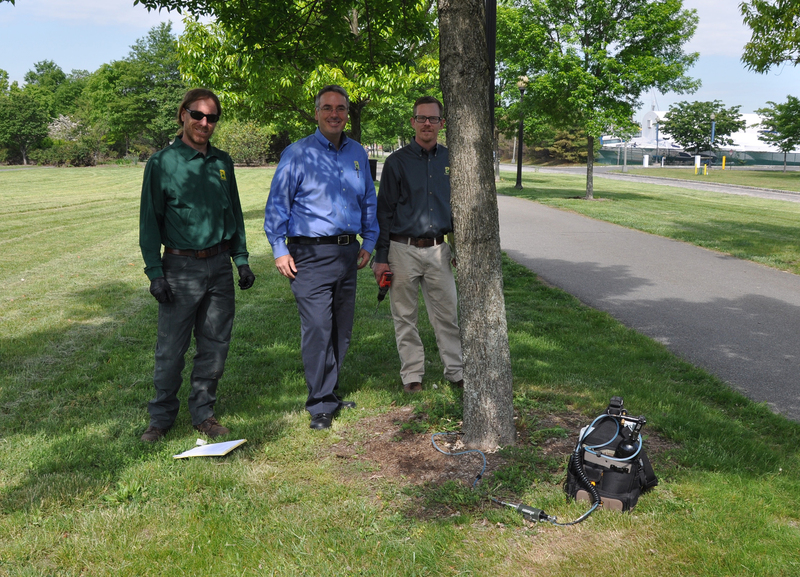 Almstead Tree & Shrub Care Company partnered with Arborjet to donate treatment for forty-one ash trees at Liberty State Park in Jersey City, New Jersey, against Emerald Ash Borer (EAB), an invasive tree pest that is currently threatening ash trees in our region. 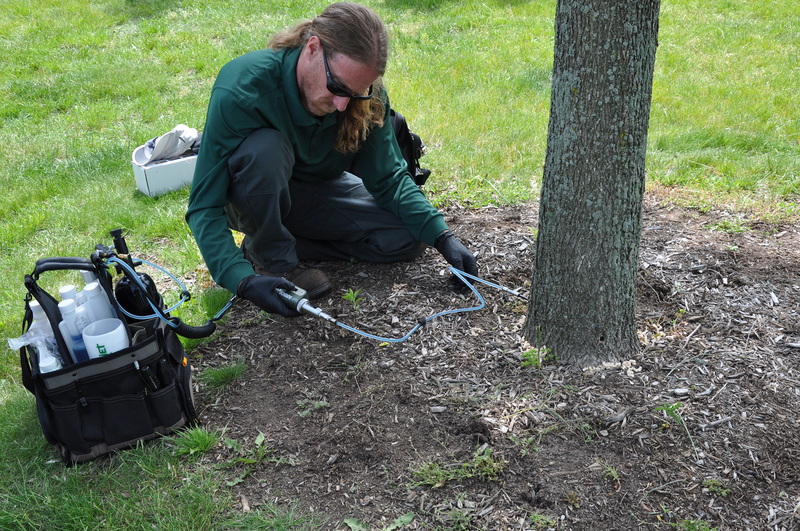 Almstead Tree & Shrub Care Company partnered with Arborjet to donate treatment for forty-one ash trees at Liberty State Park in Jersey City, New Jersey, against Emerald Ash Borer (EAB), an invasive tree pest that is currently threatening ash trees in our region. 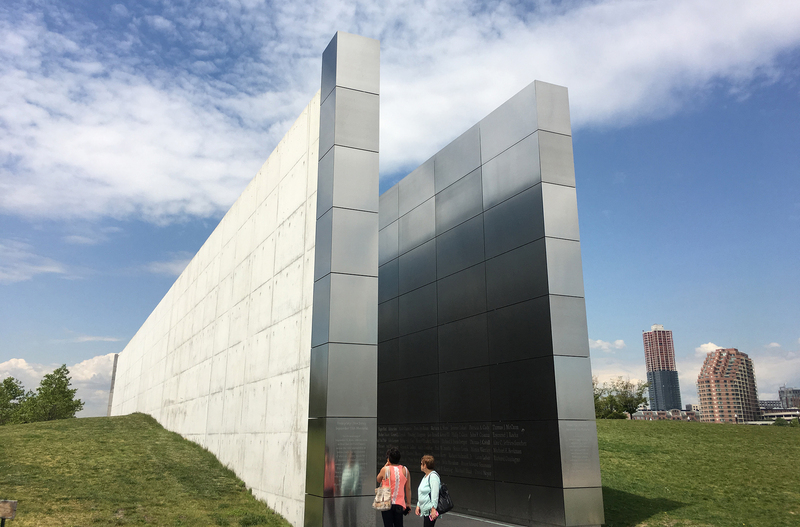 The event and demonstration took place on May 19, 2016 at the Grove of Remembrance Living Memorial area, which is dedicated to New Jersey’s victims of the September 11, 2001 attacks. Arborjet provided the treatments at no cost, while Almstead donated the labor and expertise to inject the trees. Emerald Ash Borer (Latin name Agrilus planipennis) is a small metallic-green insect that only attacks ash trees. Scientists believe that it came to U.S. in solid wood packing crates from Asia in 2002. It was first seen in New York in the spring of 2009 and in New Jersey in the spring of 2014. EAB has already cost municipalities, property owners, nursery operators, and the forest-product industry hundreds of millions of dollars. 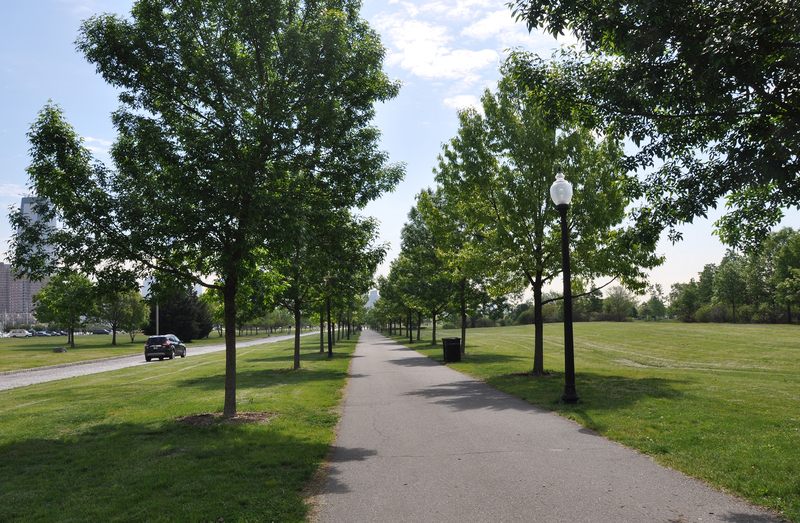 Protecting ash trees from this deadly beetle requires a combination of quarantines, that regulatory agencies are already enforcing, and insecticide treatment, such as the one performed by Almstead and Arborjet at Liberty State Park. Other speakers at the event included: Trent Dicks, Mid Atlantic Technical Manager of Arborjet; Lisa Simms, Executive Director of the New Jersey Tree Foundation; John Sacco and Carrie Sargeant from the New Jersey State Forest Service; and Jonathan Luk, Deputy Superintendent of Liberty State Park. Almstead provides treatment for EAB and other tree and plant insects and diseases, as well as complete tree, shrub and lawn services for residential and commercial customers in New York, New Jersey and Connecticut. The company celebrated its 50th anniversary in 2014. Family owned and operated, Almstead Tree & Shrub Care Company has been serving homeowners, businesses and communities in the tri-state area since 1964. It offers a full range of tree, shrub and lawn services including organic care options. Headquartered in New Rochelle, N.Y., Almstead has branch offices in New York, New Jersey and Connecticut. For more information, call 800-427-1900 or visit us online at almstead.com. Please write to marketing(at)almstead.com to request photographs in high resolution. Almstead Tree, Shrub & Lawn Co.